Instructions: Card size: 4 x 6 1/4". Cut white cardstock 6 x 12" then score at 2", 4", 8", and 10". Place the left side of the largest Diamond die on the outside left 2" side and cut to the score line then place the right side of the die on the right 2" side of card and cut to the score line. Trim top and bottom on the score line to meet the die cut if needed. Cut decorative paper to match panels (except Diamond cuts). Glue paper to each side and inside middle section. Cut Lacy Diamond die from white, cut the center part out of white as well. Cut a straight edge diamond out of pink to fit inside of center section of the Lacy Diamond. Glue pink to the back of center section then glue to the large Lacy Diamond, cut the lacy Diamond in half and glue one half to each outer section. 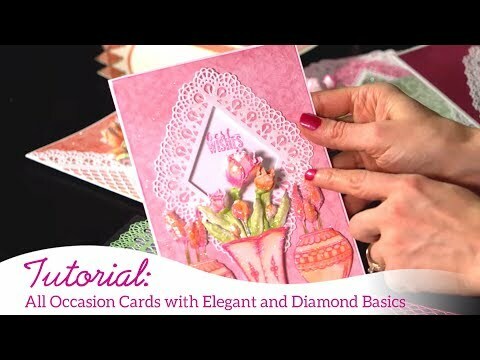 Cut Sweetheart Border twice out of white and cut off small bottom scallop to glue to the top of card. Cut border from the Album Tag Accents for top of card inside. Glue borders on the top. Stamp birds, birds on a branch, and birdhouse using black, die cut and color with Copics. Stamp blossoms using Rose Madder, sponge on Pink Peony and die cut. Stamp leaves with Fern Green and sponge with Leaf Green and Rose Madder then die cut. 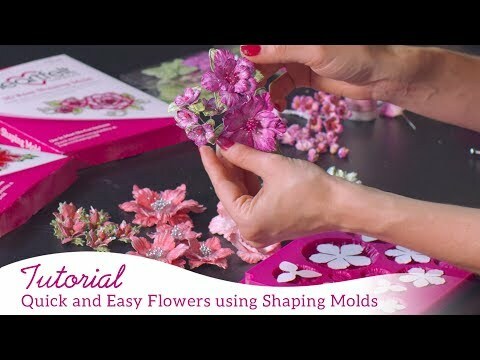 Place blossoms and leaves in Shaping Mold, spritz then run through the die cutting machine to form. Stamp Sentiment on pink and die cut with Diamond Basics then die cut a white Eyelet Diamond to mat the sentiment. Glue sentiment to the inside middle section. Randomly glitter paper inside card. Glue and foam tape birds on branch to left side only of the outside. Glue blossoms to both sides of the diamond ends. Glitter paper on the outside of card and the flowers. Make a belly band out of white cardstock 1 1/2 x 9" place "belt" around card and fold at card sides. Belly band will meet in the center front and over-lap, glue the over-lapping part together. Glue a pink strip in the center of the white all the way around about 3/4" wide. Cut 2 Eyelet Diamonds to stack in center of belly band. Glue them on so that diamonds will be in the center of diamond on the card when the belly band in on (about 1/4" of diamond will hang off the bottom of the belly band). Glue birdhouse on the center of stacked diamonds and pop up the birds. Glue some tiny Cherry Blossoms on each side. Glitter flowers and paper on the belly band. Slide the belly band on being careful that top of diamond tucks under the birds on the branch at the top. It will go all the way to but not over center of Lacy Diamond.